Surviving Nirvana members to perform with Joan Jett at Rock And Roll Hall Of Fame induction? Are the surviving members of Nirvana preparing to perform with Joan Jett at their upcoming induction into the Rock And Roll Hall of Fame? Following Krist Novoselic's April Fool's Day tweet about learning songs from Hal Leonard bass tab books (below), a cryptic photograph was posted to Nirvana's Facebook earlier today. 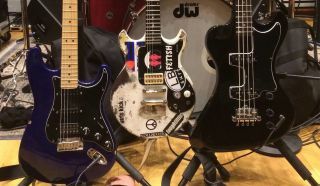 The shot shows Dave Grohl's DW drums, Pat Smear's Nirvana-era Fender Stratocaster and Krist Novoselic's signature Gibson RD bass next to Joan Jett's famous Gibson Melody Maker. Nirvana will be inducted into the Rock And Roll Hall Of Fame - apparently minus original drummer Chad Channing - on Thursday. Until then, watch this space! Total Guitar 253 features the definitive guide to Kurt Cobain's guitars, plus Kurt's final guitar interview. On sale 14th April.